One pan, 15 minutes and dinner is served! This may be one of the easiest and yummiest dinners ever. One pan, 15 minutes, and dinner is served. 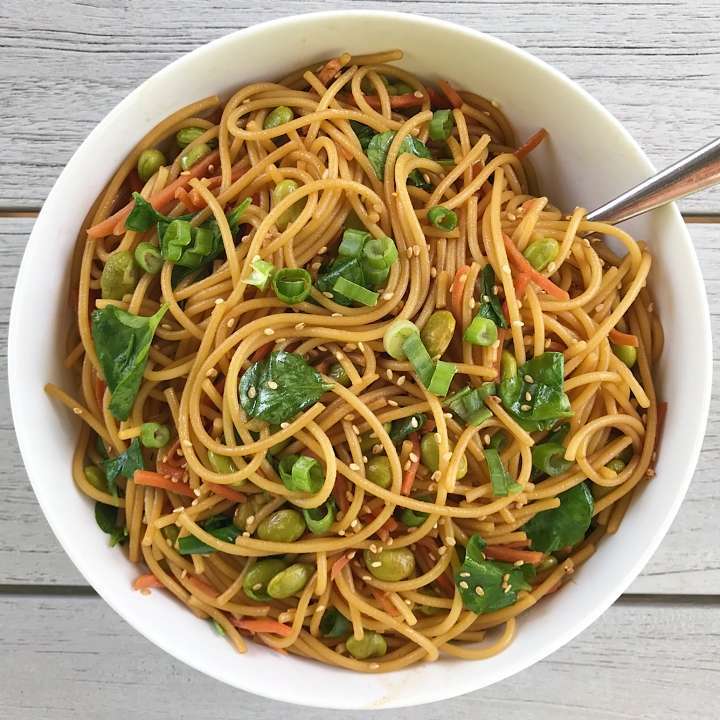 Gluten-Free noodles, frozen edamame, shredded carrots, watercress & sesame seeds all tossed in a simple tamari based dressing. 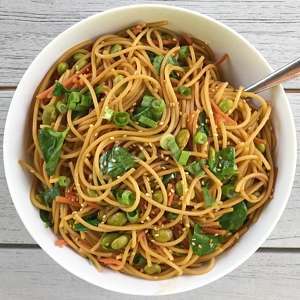 The edamame and carrots cook up with the pasta. Then everything is mixed together in one big bowl. That’s it! Such an easy, crowd pleasing meal. Tastes warm or room temperature. This recipe was adapted from Vegetarian Times Magazine. This is a super quick,easy and delicious dish. One pan, 15 minutes, that's it! Recipe adapted from Vegetarian Times Magazine. Whisk together soy sauce, vinegar, sesame oil and 2 Tbs. water in small bowl or liquid measuring cup. Set aside. Add edamame and carrots to boiling water, and continue cooking until noodles are tender. (If package says noodles cook in 5 minutes, add all ingredients at once.) Drain into a colander. Return entire mixture to the cooking pot. Stir in watercress, green onions, sesame seeds and dressing.